A Real Estate Match Made In Heaven? MarketWatch recently posted its 12 Housing Themes for 2012. Aside from the usual talk of foreclosures, financial distress, Fannie Mae and Freddie Mac, there were two themes that made us sit up and take notice. Number 6 (Multi-family Momentum) and number 12 (Housing Demographics of Young People). According to Arlington Town data*, multi-family homes account for more than half of the available housing units in town. Approximately thirty-five percent of all housing units are in multi-family structures with two to four units, and twenty-five percent are in multi-family structures with five or more units. Forty percent of the housing units in Arlington are single-family structures. Just like a financial portfolio, one of the many reasons Arlington real estate has weathered this storm is diversification. We do not have all of our housing eggs in one basket, so if the single-family market is struggling, we have multi-families and condos to fall back on. If condos and multi-families are hurting, we can ride the relative strength of single-family home sales. The single-family market in Arlington has stayed relatively strong, with a 1.6% increase in home values from 2010 to 2011. The multi-family market has been flat, with little-to-no increase. According to MarketWatch, this is going to change: "The hottest sector in real estate right now is multi-family. It seems like everyone wants to buy apartment buildings, in particular in coastal metro markets where rents are going through the roof. 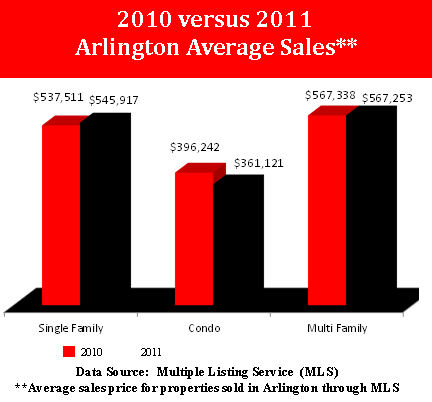 .."
So if one of the themes for 2012 is for the multi-family market to heat up - and Arlington has a multi-family market that's ready for an upswing - who are the buyers? This brings us to theme number 12: The Demographics of Young People. Raise your hand if you a) have a child older than the age of 18 living at home, b) this child is at home because they can't afford the increase in rents, c) this child is home because they can't afford the down payment for a home. Sound familiar? If not you, then I'm sure you know of at least one other parent or child in this situation. According to the Census Bureau, the number of 25-to 34-year-old adults in the U.S. living at home rose from 14 percent in 2005 to 19 percent in 2011. While this can sound dire, it also means that a significant pool of potential buyers has been saving up and biding their time until the market looks more favorable. Rents are rising and single-family homes are still out of reach for many young buyers, making the multi-family and the boomerang a possible real estate match made in heaven.